The University of West Florida archaeology program announced today the discovery of a third shipwreck from the Spanish fleet linked to Tristán de Luna y Arellano’s 16th century expedition to modern-day Pensacola. The discovery comes less than one year after UWF archaeologists identified the terrestrial site of Luna’s colony in a developed neighborhood in Pensacola, marking the earliest multi-year European settlement in the U.S. The third shipwreck was found in Pensacola Bay near Emanuel Point I and II, the first two shipwrecks linked to the Luna expedition. Emanuel Point I was found by archaeologists from the Florida Bureau of Archaeological Research in 1992 and was later investigated by BAR and UWF. Emanuel Point II was discovered by UWF during a summer field school in 2006. The third ship, Emanuel Point III, was discovered by UWF archaeologists and students during the Combined Archaeological Field Methods course on June 20, 2016. 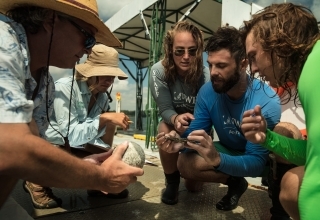 After identifying the land settlement in 2015, the UWF team was able to narrow the field of search for the remaining shipwrecks during the summer field school in 2016. The UWF team has discovered ballast stones, iron concretions and articulated hull of the ship, including frames and hull planking, as well as remnants of ceramics once carried on it. They received a joint permit from the Florida Department of Environmental Protection and the U.S. Army Corps of Engineers to conduct test excavations through March 2017 to determine the extent of the shipwreck and the type of wood used to make the ship, which will indicate if it was among the earliest ships to be built in the New World. The UWF archaeology program’s exploration of the Luna fleet has been funded in part by a Special Category Grant totaling more than $290,000 from the Florida Division of Historical Resources. The matching grant, awarded to UWF in 2014, provided funding for faculty, staff and students from UWF to conduct fieldwork, laboratory analysis, artifact conservation and curation, archival research in Spain and public outreach in all seasons for two years. Maritime field investigations by UWF, including continuing survey and excavations, have mainly focused on the six ships that were lost during a hurricane that hit Pensacola Bay in September 1559. 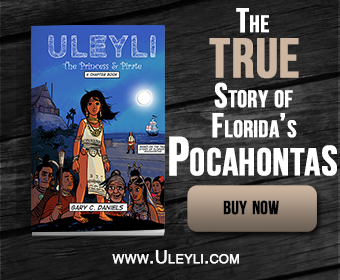 The Luna expedition included 1,500 soldiers, colonists, slaves and Aztec Indians who traveled in 11 ships from Veracruz, Mexico, to Pensacola to begin the Spanish colonization of the northern Gulf Coast. The hurricane hit Pensacola one month after they arrived, sinking many of their ships and devastating their food supplies. After two years, the remnants of the colony were rescued by Spanish ships and returned to Mexico. The Luna settlement in Pensacola lasted from 1559 to 1561, which predates the Spanish settlement in St. Augustine, Florida, by six years, and the English settlement in Jamestown, Virginia, by 48 years. Emanuel Point I was found in 1992, and UWF archaeologists continued investigations through 1998 under the direction of Dr. Roger Smith, Florida State Underwater Archaeologist. In 2006, UWF archaeologists and students located Emanuel Point II. UWF continued to examine the second shipwreck with its summer field schools until grant funding was received in 2014. The funding has allowed UWF archaeologists to work continuously at the site and search for additional shipwrecks for two years. The Luna land settlement was identified in October 2015 when Pensacola native Tom Garner discovered Spanish colonial and Native American artifacts at a privately owned residential lot within view of the two uncovered shipwrecks in Pensacola Bay. UWF has continued investigations at the settlement site since it discovery, including offering a land-based field school during Summer 2016. Together, the shipwrecks and land settlement provide a unique insight into the earliest multi-year European colonial settlement to be archaeologically identified in the United States. UWF’s research related to the Luna expedition is sponsored in part by the Department of State, Division of Historical Resources, and the State of Florida. Other sponsors include the UWF Archaeology Institute and the Florida Public Archaeology Network. To learn more about the Emanuel Point shipwrecks and the Luna land settlement, visit uwf.edu/luna.